The constant steady beating of the rain threw our plans of laying a foundation and building a preschool right out the window. We came with a plan, but God has final control over what ends up happening so we were left with, “now what”? “No worries”, Gerald said. Off to Nyamirama Primary School we go. As the bus pulled up to the school one of the students commented that it looked abandoned. We stepped off the bus only to be greeted by 470 students ages 3 - 15. The structure may have appeared to be abandoned but the soul and spirit of the school was much alive. After walking the perimeter and getting a close up of what was needed we realized that we would have plenty to do here. Between the downpours, drizzles, and every now and then the sun peeking through, we began sanding, plastering, priming, and painting inside and out. We added “skylights” and gutters to the roofs along with a 3,000 gallon water tank. New windows and some simple interior decorating of the toddlers rooms brought so much excitement to both the children and the staff. A transformation was taking place. One that we hoped would reflect the pride and strength of the children and staff at Nyamirama School. We left with a deep understanding that in this moment and in this time and space we were meant to be. Friendships were formed and deep, profound love was exchanged. No worries. The last two days found the weather cooperative and we were able to begin the digging and laying of bricks for the preschool project. Like the multiplication of the loaves and fishes we were asked to multiply our projects, and how blessed we all were to be able to be a part of them. 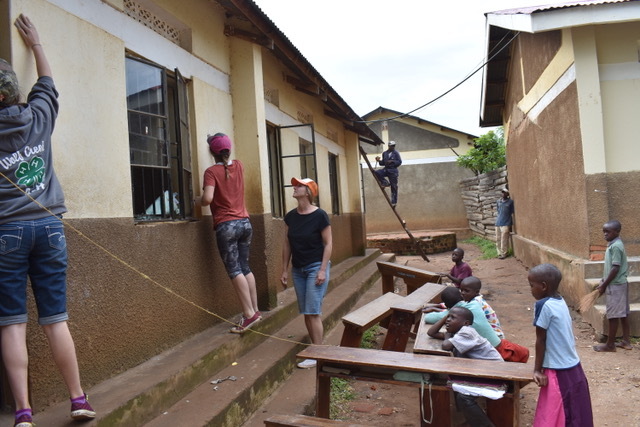 We invite you to continue to follow the updates on the preschool and encourage you to donate for next year’s campaign of adding a library and outdoor play area at Nyamirama. Abundant blessings on all those who give us the opportunity to transform ourselves through service and love.